Harina Masa / masa nixtamalera milling machines at commercial capacity. This is the product obtained through the nixtamalization process, also called masa nixtamalera whereby maize (corn / mealies) is cooked and steeped in a slaked lime (calcium hydroxide) or wood ash solution which dissolutes through its high alkalinity the hemicellulose and separates the bran and germ from the endosperm and softens the kernel. It also binds the protein chains and breaks down the oil into emulsifying mono- and di-glycerides. This chemical reaction allows the maize to form a pliable dough after washing and milling and is then used to process various Mexican dishes such as tortillas, tamales, pupusas etc. The fresh masa may be dried and then milled into a powder which is then termed masa harina or masa seca. A gruel like mixture of cooked masa and water or milk to which may be added other ingredients like sugar and cocoa or chocolate, or aniseeds creates beverages called atole and champurrado. 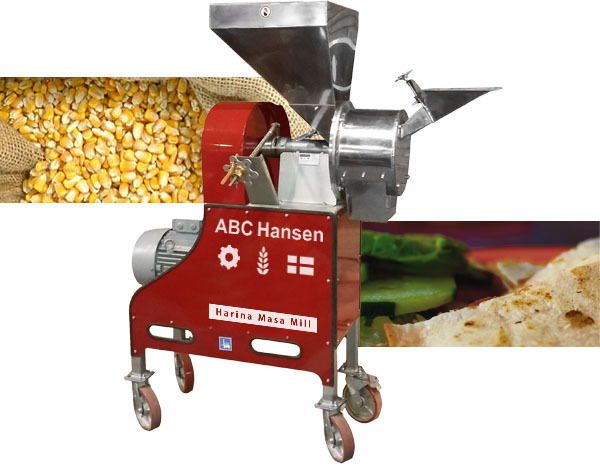 The Universal mill, with plates, is perfect for this application while very fine milling of dried masa can take place on a stone mill.